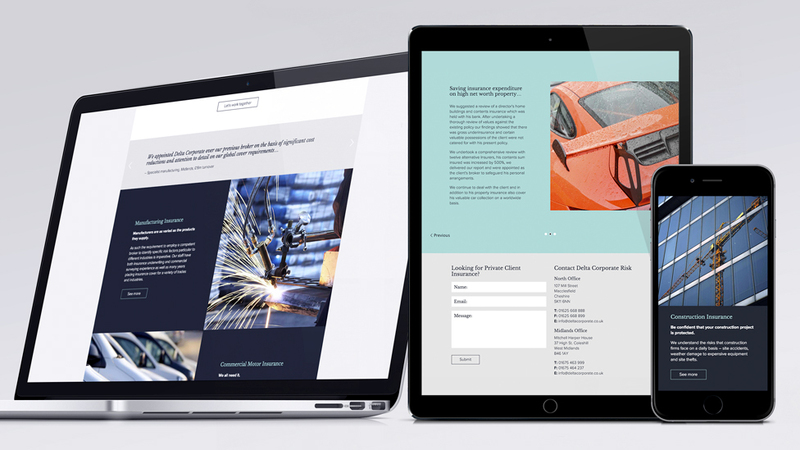 A strong example of teamwork between client and agency, we produced a new corporate website design that was a total departure for our client. 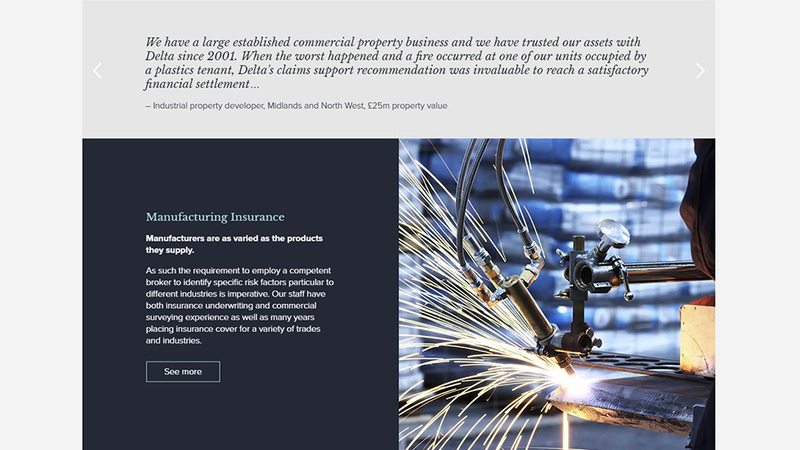 To support growth targets, insurance brokers Delta Corporate Risk had identified a need for a website design that matched the expectations of their target customers – companies from across a wide spectrum of sectors including law, property and construction, as well high net worth private customers looking for insurance solutions to meet their very specific needs. The corporate website design had to be a total departure from the previous incarnation to engage Delta’s savvy audience. The website also had to serve as a springboard to launch the company’s new brand, which we had worked on in tandem with the new website. The new design was the result of true collaboration between client, designers and developers as – inspired by examples of work on our own website – our client had shared some specific preferences with our team at the start of the project. The website has a premium feel, making Delta’s target customer feel affinity from the moment they land on the website, and whetting their appetite to find out more. 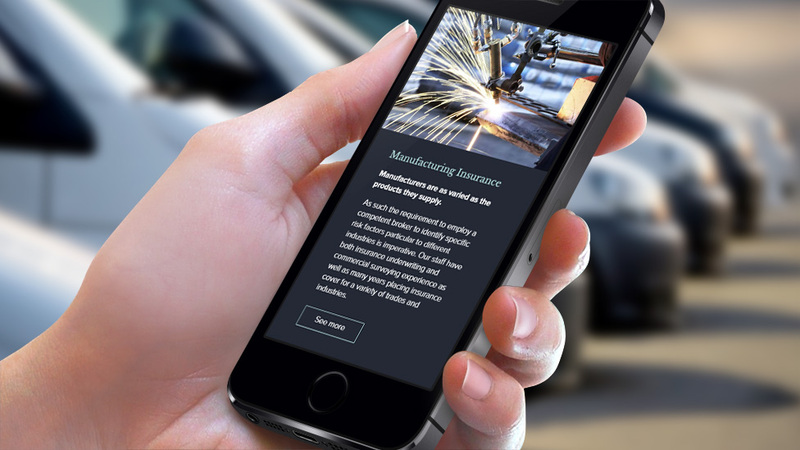 The wide array of sectors covered and products offered is presented in a clear way, while the functional design turns the customer journey into a tailored experience, making it very easy for the audience to cherry pick what best suits them. The website succeeds in attracting different types of audiences, ensuring no prospective customer feels alienated and reaffirming the website’s role as a sales tool. We complemented the design with editorial style images that we sourced for the client. From a website development perspective, we carried through the premium design ethic using scalable graphics for retina screens, and smooth and subtle animation transitions for user interface elements and images. 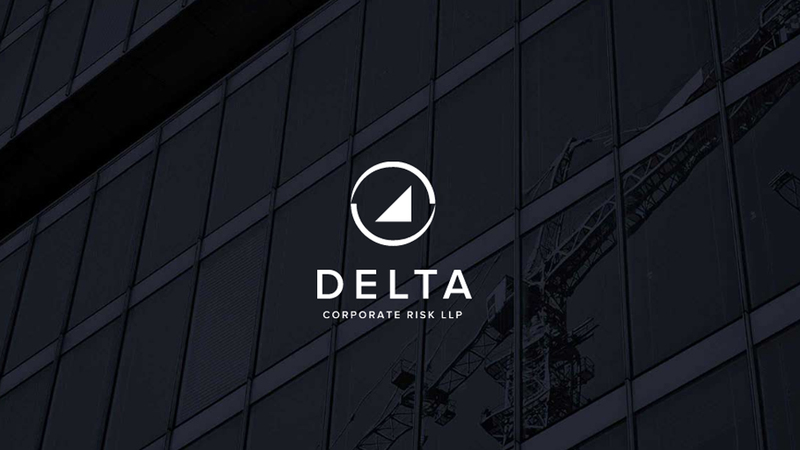 Delta was so happy with the corporate website design and content flow that they have now commissioned us to also rebrand their office.